I made good progress on this teal and gray scarf yesterday while binge-watching 11.22.63 on Hulu. (SO good, and I loved the book so I was worried, but I really enjoyed it and am now reading the book again.) Anyway, nine hours of TV means lots of knitting time. 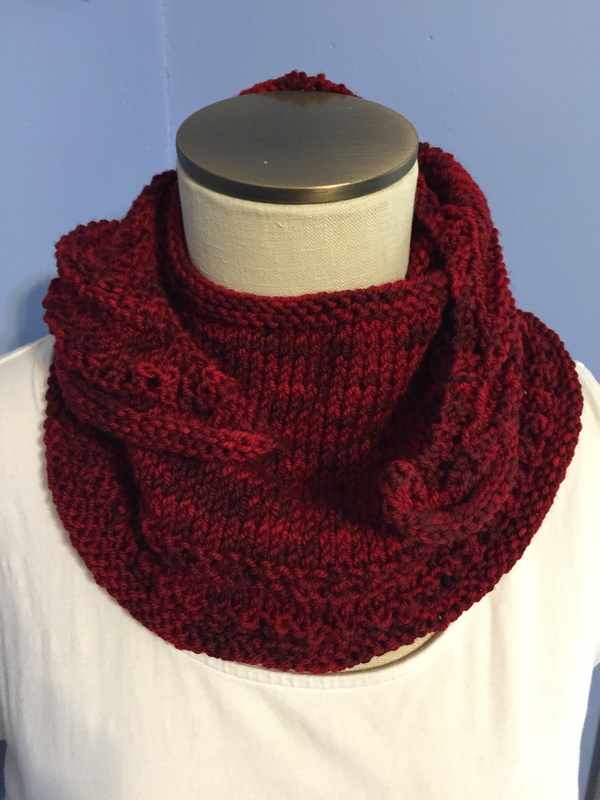 Pattern for this one is Quickie Cowl and yarn is Classic Elite Yarns Chalet and Chateau. This one is another Twinkly Lights Cowl like I made for my SIL (the tan/brown one I showed you before) only this one is in Cascade Yarns Baby Alpaca Chunky. I also did it correctly this time, with the wider center section, and I love it. It’s dense and heavy and warm, and I know I’ll be wearing it a lot when the temperatures drop again. I managed to score some more Cascade Spuntaneous Yarn, this time in purple and pink, and the purple one ended up being my Christmas Eve party knitting. And when I finished it, the hubby snagged it because he was chilly. And he liked it too! Well. Challenge accepted! I popped over to Ravelry and found this perfect pattern (had to buy the book; don’t know if I’ll make anything else from it anytime soon) but didn’t have the right yarn. I made it to the yarn store two days later and cast on that night with some Cascade 220 Superwash. It needed to be warm, resilient, and preferably washable, so I chose a good workhorse of a yarn. As I began knitting, I remembered how much I dislike knitting from charts. I especially dislike them when the chart is in iBooks and I can’t get it into my knitting app to keep track of rows. So yeah, I wrote out the charts and knit from that instead. Worked pretty well! Six hours later, I had a buff ready to wrap. Isn’t it so pretty?? I love the design; I think I want to make it again but with a looser fit. I think he liked it. I mean, I know he looks scary here, but he’s really not. And he says it’s warm. I call this one a Gift Knitting Win! Okay, last project. This one was also last-minute. Like I made it on Christmas Eve and gifted it the next day. I’d wanted to make something for my aunt but couldn’t think of what to make. 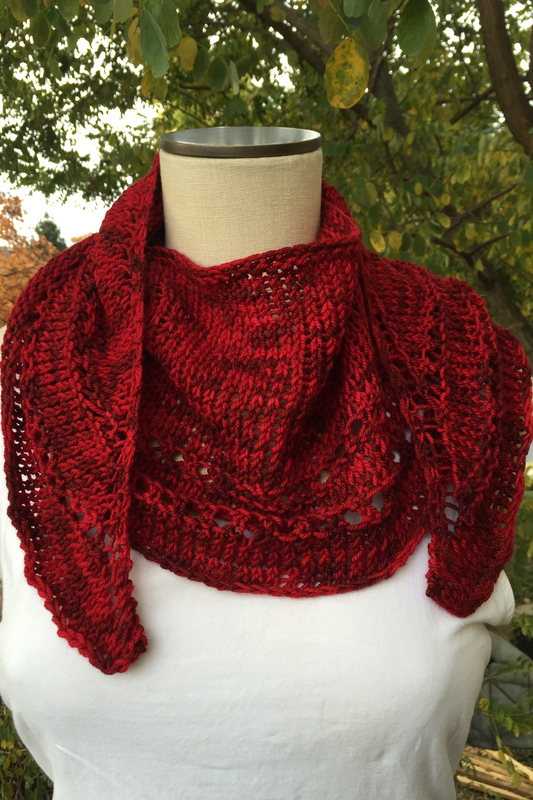 While browsing Instagram, I saw a photo of ErikaShmerika’s First Leaf Neck Wrap and thought AHA! A quick bulky project that’s a little bit different, that’s perfect! I pulled out some Berroco Kodiak in the color Harbor Seal (code for Gray) and knit this up while watching Jurassic World. Jack was so kind and modeled for me after I finished it. I think he looks quite handsome. But his patience didn’t last too long and I did need to add a button. 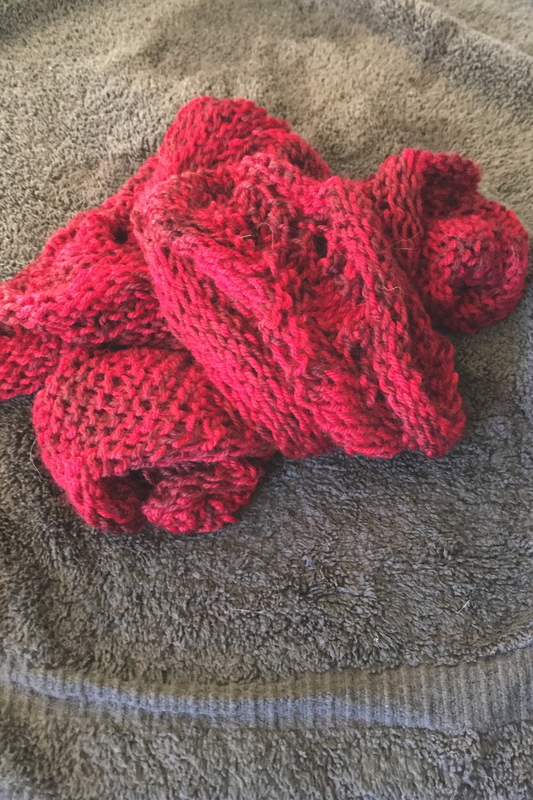 I think this is a really cute scarf, and the yarn is warm but so fuzzy and lightweight. The pattern called for a full-length scarf but I liked the idea of a more unusual buttoned neckwarmer, and bonus: it worked perfectly within my time constraints! I do enjoy gift-knitting when it goes well! And now the gifts are put away, the kids are busy with their new gadgets, and I can settle in and do more knitting. And because my family knows me and loves me, I can start a round of selfish knitting with MY new gadgets: a new YarnPop bag and a yarn valet! I hope you all had joyful holidays with plenty of knitting time and just enough family time! Of course I had to decide, at the last minute, to make some Christmas gifts. All along, I told myself I wasn’t going to stress over making handmade gifts. I had one gift made months ago and was enjoying my selfish knitting time. 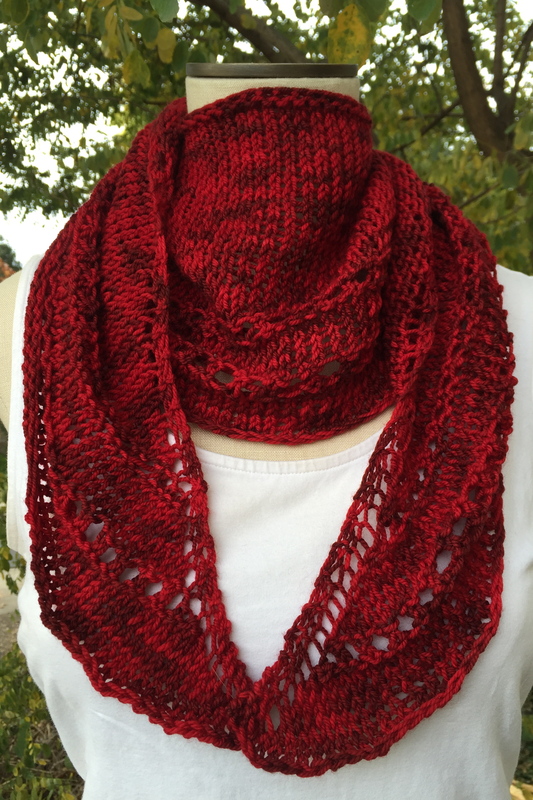 But then the urge hit me — and I really wanted to make a cowl for this specific person. I had a vague picture in my head, along with an idea of what yarn from my stash I wanted to use, and I took to Ravelry. I soon found the Twinkly Lights Cowl and knew it was perfect. I cast on immediately and was done within about three hours (spread over a couple of days). I loved knitting this and will definitely be making more. I really want to do a black and gray version like the original. I accidentally did only 10 rows of Color B in the middle, instead of 20, but I don’t mind. I think it came out a good height, warm without being too bulky. The yarn is Cascade Yarns 220 Superwash in colors Chocolate and Extra Creme Cafe, and I used less than a skein of each. This is lovely yarn to knit with; it feels dense without being heavy, firm but still soft. It’s not luxurious the way some yarns are, like alpaca, but it’s a great everyday yarn perfect for hats and cowls. Probably mittens too, maybe I should try that! I also started a new scarf this week. For a brief moment, I thought it could be a gift, but then I came to my senses when I realized that A) Christmas was six days away and B) this is a SCARF. 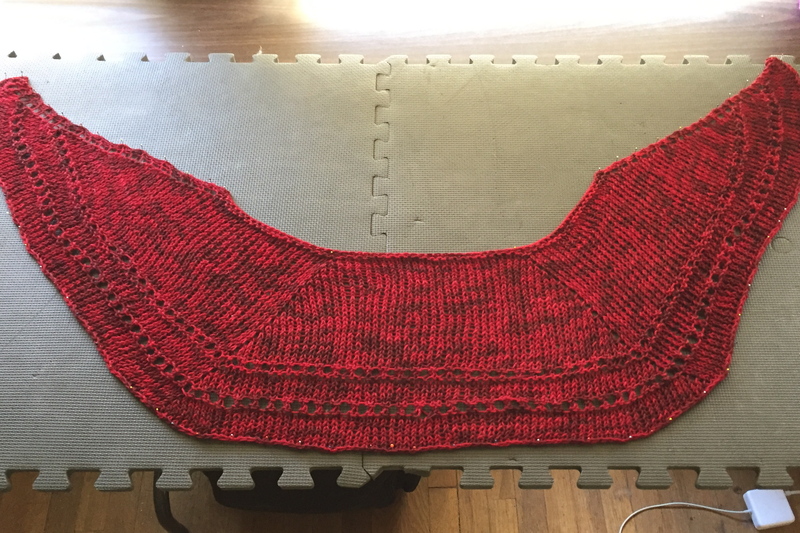 Now, this will be a shorter scarf, but still. A scarf. And my knitting time is still hampered by this crazy job thing. Anyway, I made a scarf for my husband a couple of years ago and we all love it and occasionally steal it. The pattern is Quickie Cowl (only I modify it to make a scarf) and it’s knit with CEY Chalet and it’s just so cozy and warm. It finally occurred to me that I could make another one, since I have more of that yarn in the stash. In fact, I have two skeins of a gorgeous deep teal and a skein of light gray to coordinate. I decided to use the same pattern since we like it so much but noticed I’d used a smaller needle than recommended the first time around, so I went up a needle size and cast on. Hope you’re all ready for the holidays coming up! I know I’m not! But at least it’s getting bigger! I knit on it after working out yesterday, while introducing the girl to the magical train wreck that is Keeping up with the Kardashians. It’s so funny to watch. (“Jump the shark? What does that mean? Don’t they mean jump ship?” and “The girls think you have this disease called colonoscopy.”) I know. I’m sorry. I can’t help it. Please don’t judge me. Actually, you can judge all you want. I’m still going to watch it and laugh. Anyhoo, I knit on the scarf a lot, and it went to flute lesson too, and it’s growing by leaps and bounds. I added on the second skein after flute lesson and knit some more last night while the boys watched The Flash. (Season finale! So dramatic!) I’m in love with this scarf and this yarn. I could pretend that I’m going to work on the mermaid blanket today, but let’s be honest. I’m going to knit on this scarf until it’s done. Then, and only then, will I return to the mermaid blanket. Here’s a fun shot of Grace. The hubby took both dogs on a 2-mile run yesterday and wore them out big-time. But they were so happy! We have had rain for days and it’s still cloudy and gray. Here’s hoping there’s sunshine wherever you are! I cast on a new project yesterday. I didn’t mean to, it just…happened. I was near a Joann store, and I had three coupons about to expire, and nobody likes to let those coupons go to waste, right? There was nothing I needed, but I thought I could get some fun acrylic to add more inexpensive items to my inventory. I wandered around, enjoying the colors, and pondering several different yarns. Then I saw THIS yarn, and the choice was made. As soon as I got home, I perused scarf patterns, wanting something simple and quick to make that would show off the colors. I settled on Diane’s Diagonal Scarf, similar to a candy cane scarf I’ve made before, and cast on. If only it were that simple. 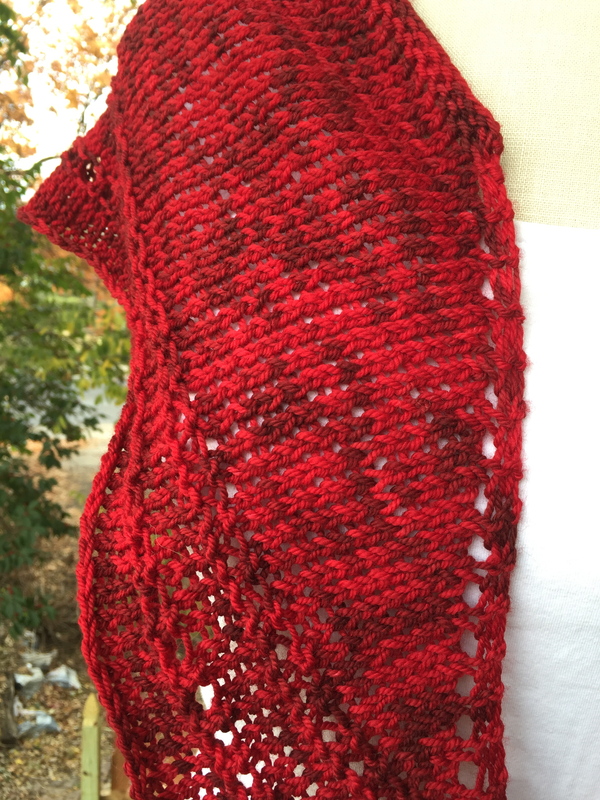 That pattern said it made a scarf 4″ wide, and I wanted wider, so I cast on more stitches. My first attempt was too wide and too dense. I switched to bigger needles and fewer stitches. Good fabric but still too wide. Cast on again, settling on 31 stitches. I will note, this yarn does not like being frogged. It’s all fuzzy, so it likes to catch on itself and get stuck together. But I do love the colors, and it’s nice and soft to knit with. 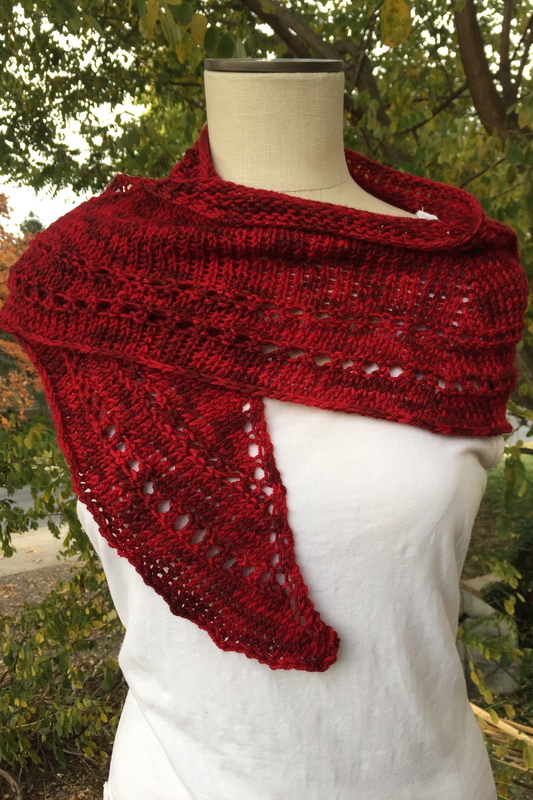 Back in May, I finished this gorgeous shawlette in Baah! Sonoma Chocolate Cherries. Since then it’s lived folded up in my craft room waiting to be washed and blocked. Now that the weather is turning cooler, I decided I needed to get it ready to wear. Here’s what it looked like pre-blocking: A little bath in some Eucalan and here’s what I had: Not very encouraging, is it? But here’s the wonderful thing about wool: you can tug and pull it into shape and you end up with something like this: I’m not the best blocker; it may not be perfectly symmetrical. And the stockinette edge on the bottom will still curl up. But those tiny things won’t matter once it’s unpinned, and doing this will open up those little eyelets wonderfully. Since that’s why I picked this pattern, I think I’ll be happy with it. Stay tuned for photos once it’s dry! I’ve been on a roll lately! In the last couple of days I’ve completed two more WIPs, bringing me down to only three still on the needles. One of the new FOs was my Mother’s Day project, the Chocolate Cherries shawlette with the Baah wool. It hasn’t been blocked yet, so the yarnovers aren’t as open as they will be. 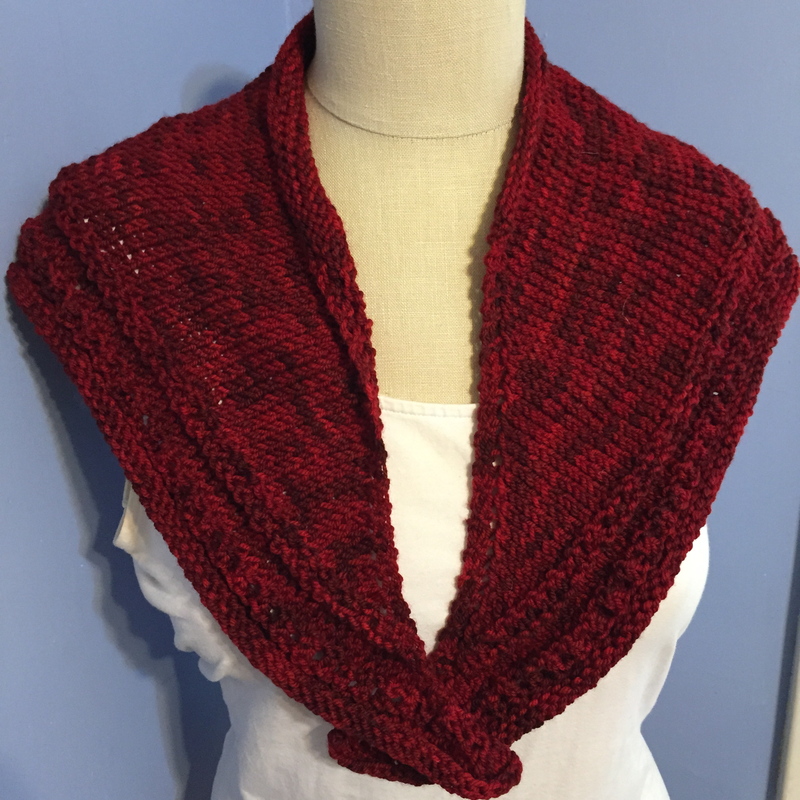 I’m also hoping I can block it a bit longer, because I wanted to be able to wear it like this: I absolutely loved knitting with this yarn. The colors are so gorgeous, and the yarn is perfect, soft without being limp. It has great stitch definition. I have another skein of this, and I’m looking forward to finding the right project for it. 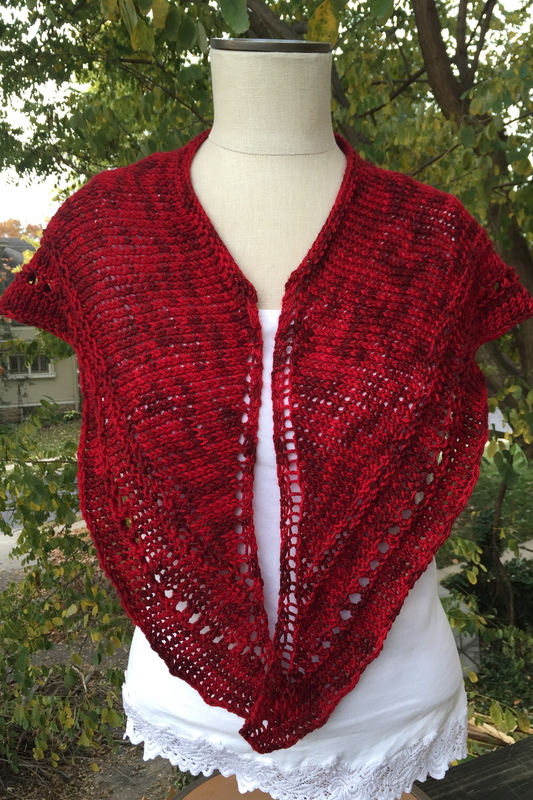 My Ravelry project page for it is here, or you can go directly to the Find a Penny pattern page. 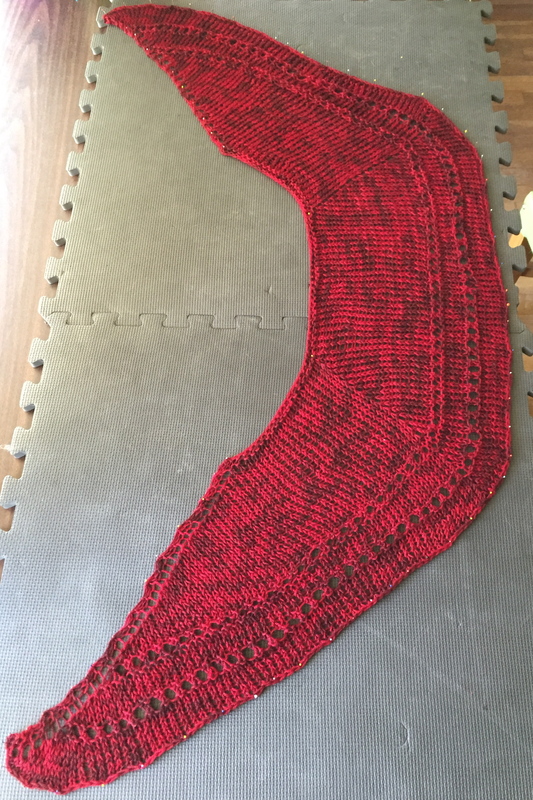 My other FO is another Oh, Helen! mesh scarf. 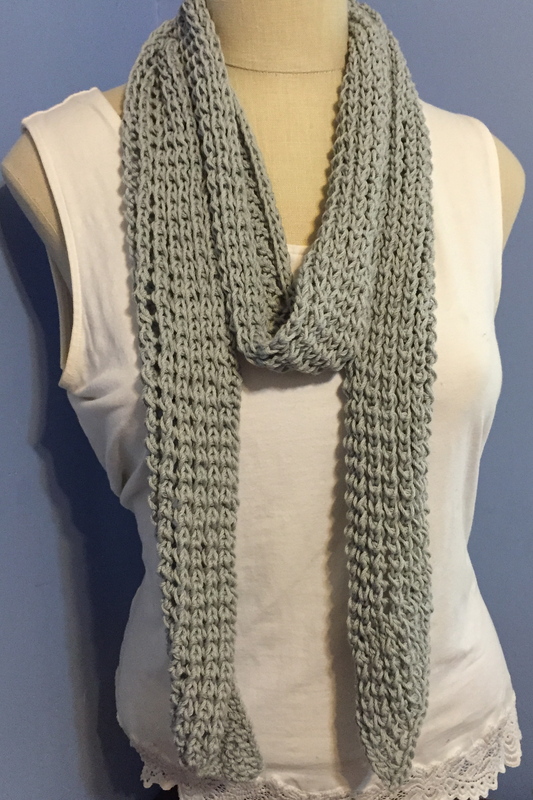 This one I made in a silvery-gray Berroco Weekend. It’s a worsted, not DK, so I cast on fewer stitches and used size 9 needles. I rather like this one better than the first, pink one. It doesn’t roll quite as much so you see the pattern better. I made this so I’d have something versatile and lightweight to wear when I do craft shows so I can model my wares! I haven’t been knitting as much the last few days, though, because I’ve had another project going. 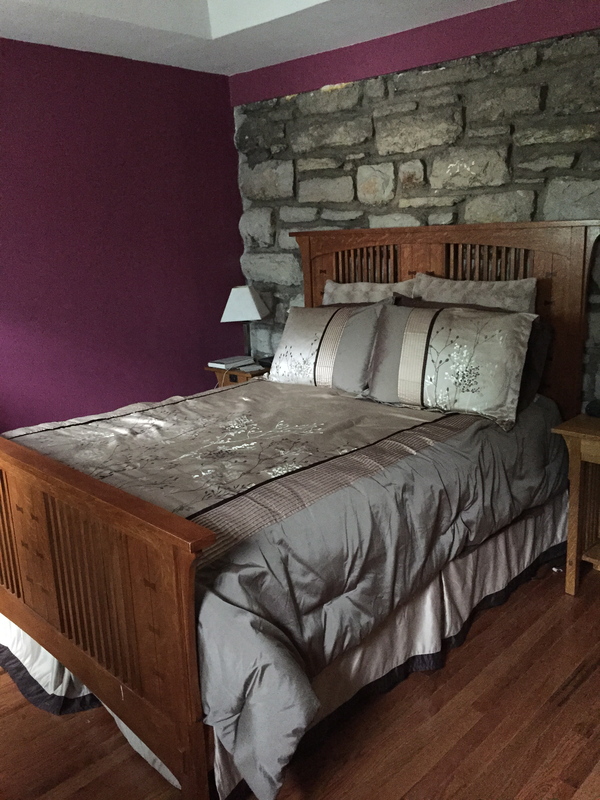 For the first time in my adult life, the first time in the almost 18 years I’ve been married, I have an actual bed with a headboard and footboard! We’ve always just had the metal frame that comes with the mattress. We waited at first because of money, then the husband wanted to make them. I think he would still like to, but he’s got a lot of things going on, and it probably won’t happen for a while. 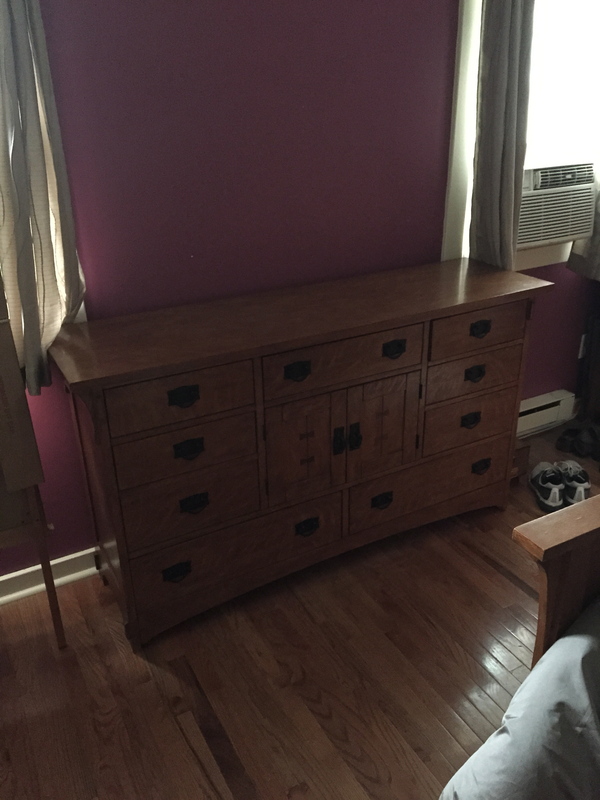 Then a friend of mine mentioned she wanted to sell her bedroom set with a bed, dresser and nightstand. It just happened to be oak and the Mission style that I love and that matches the nightstands the husband made several years ago. She was asking a fair price and it just seemed like too good a deal to pass up. The downside was that it meant quite a bit of manual labor, to move them home then clean out the bedroom and set up the new furniture. I took apart the old bed and set up the new one ALL BY MYSELF (okay, the boy helped a little bit) but I needed the help of the husband and brother to move heavy dressers. Last night it was all set up and I could appreciate my new grown-up bedroom! The dresser has a matching mirror, but the husband was too tired to attach it last night. Maybe tonight. Anyway, I’m delighted with it. And last but not least, here’s a recent puppy photo. 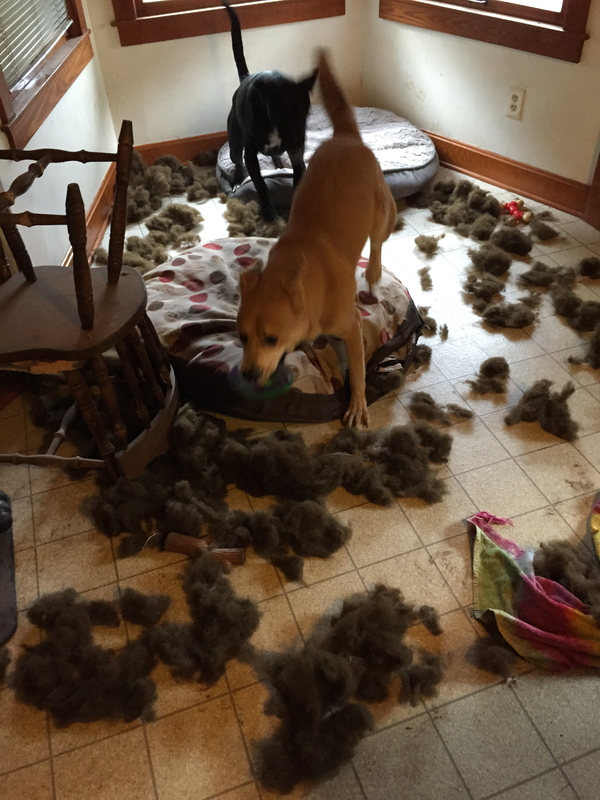 Remember the new dog bed Grace tore up? The one I mended and sprayed with the bitter apple spray? Yeah. Here it is. I give up. I mean it, I really and truly give up. No more new dog beds. At least now I can look at this and chuckle. This was Monday, and nothing’s been destroyed since then. Fingers crossed we can make that trend last a while!